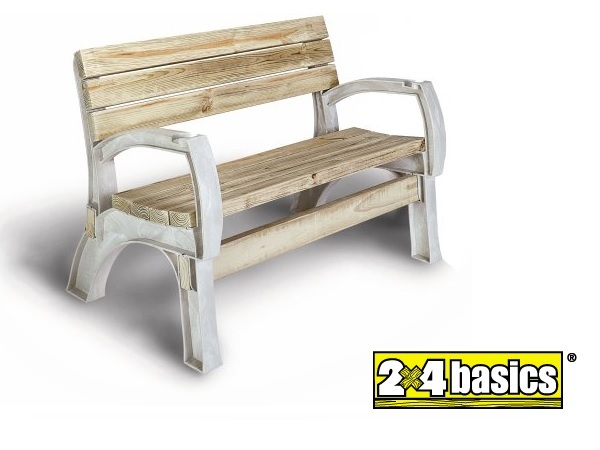 2×4 Basics bench ends will create any size bench or chair, to fit your exact needs. A perfect solution to patio or deck chairs, these bench ends can be made into chairs or benches of any length. Need a 17″ wide chair? Perhaps a 36″ wide chair? Maybe you need a 4, 6 or 8 foot long bench. What ever your needs, you can accomplish this with 2×4 Basics bench ends. The 2×4 Basics bench ends are simple to assemble using 9 lengths of 2×4 (the same length). Yes, go to Home Depot and have them cut there! Don’t forget to pick up some exterior stain or paint and beautify your lumber before attaching them to the bench ends (it’s easier than staining them in place!). These 2×4 Basics chairs/bench ends have received raving reviews and pictures from customers – people can’t say enough good things about them! The ergonomic design makes this seating option comfortable (the finished bench will have a curve that makes it comfy!) Constructed of maintenance free resin, you’ll enjoy these chairs….or benches for many years to come.